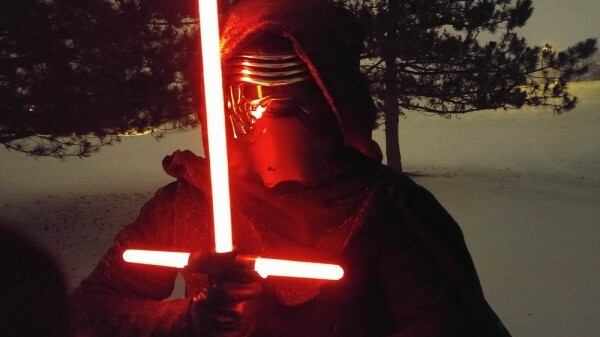 The Force Awakens Kylo Ren Costume « Adafruit Industries – Makers, hackers, artists, designers and engineers! Star Wars: The Force Awakens has inspired cosplayers since the release of the first teaser. I have a feeling Reys and Kylo Rens will be out in force at conventions this year. 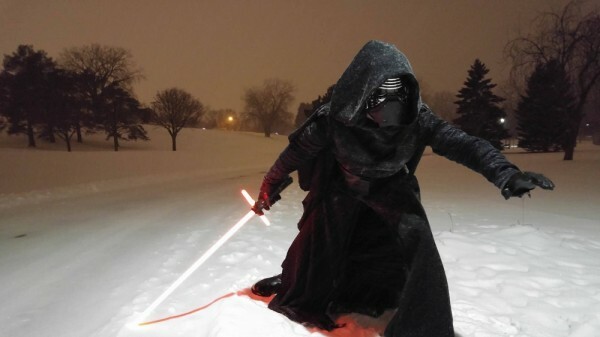 Redditor Alhon finished his Kylo Ren costume just in time for the premiere of the movie on December 18 and recently took the ensemble out in a blizzard in Minnesota for a photo shoot. Happily, the costume is plenty warm enough for that weather with an undercoat, an overcoat, and liner — that may not be such a selling point for convention season. I manually folded my fabric pleat by pleat, glued it down (Yes, I should have sewn it, but I had screwed up in how I was supposed to sew things, so a test run I did was… not good), and then cut and sewed it like the rest of my fabric. It’s a rough linen for the sleeves, for the undercoat which you can’t really see in these photos that go from a mandarin collar down to below my knees… and yes, that’s all pleated all the way down), and for an extra skirt liner that goes into the overcoat. The overrobe, hood and shawl is a cotton basket weave. Sleeves are lined with Cotton and the belt is vinyl and craft foam, with the buckle made out of craft foam covered in worbla with the usual sanding, priming, and painting on it.